Apple has launched a promotion designed to get users adding money to their iTunes and App Store accounts. Until Thursday, March 14, anyone with a valid payment card listed on their account can add a one-time top-up and get a 10 percent bonus. Apple states that this applies to any amount you add from $1 to a maximum of $200, but in practice the amount depends on the device you’re using. Go to the App Store on an iOS device, tap on your name, and then on Add Funds to Apple ID. You’ll then be shown details of the promotion and list of five different amounts you can add to your account. These are $10, $25, $50, $100 and $200. Apple lists the bonus amount next to each, ranging from a $1 bonus to a $20 one. It’s slightly different if you use your Mac. In the Mac App Store, click on your name at bottom left, then on View Information. You’ll be prompted for your Apple ID password and then given details of various choices such as purchase history. One option is Add Funds to Apple ID and it again shows you a series of amounts you can add. The last one, however, is Other, and if you click on that, you can then type in any amount from $1 to $200. This bonus is available to US users, but Apple is reportedly offering similar promotions in selected other countries such as Germany. 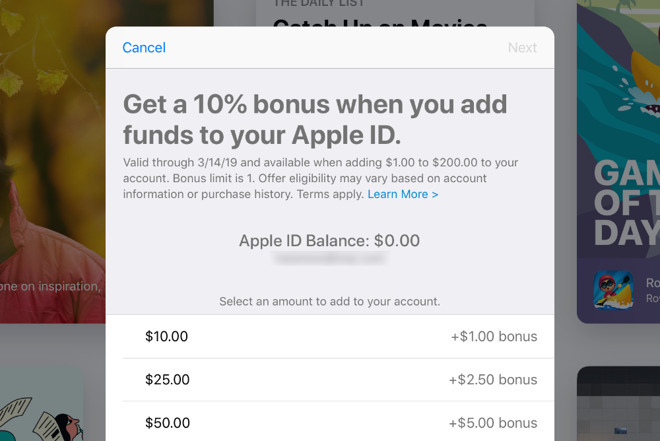 Note, however, that the promotion says that “offer eligibility may vary based on account information or purchase history.” Apple doesn’t explain what these conditions are, but it means that even if you have a US iTunes account, you may not be offered this bonus.